Brent Burns wears a Chewbacca mask in the Breakaway Challenge and the hockey world erupts. Finally, his evolution is complete. Burns said after the competition that he had purchased the mask online from Amazon. [s/t Uproxx]. Jamie Benn and Tyler Seguin checks out Jaromir Jagr’s famous hair. 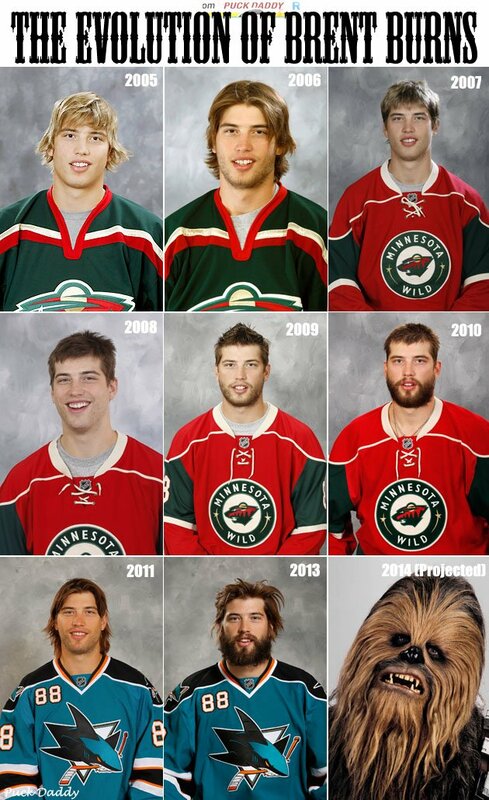 It is the most famous hair in hockey history. After missing the first few, Evgeny Kuznetsov makes four straight saucer passes into some mini hockey nets during the Relay Challenge. First time I’ve seen four straight in this challenge. Dylan Larkin breaks Mike Gartner’s record for the Fastest Skater Competition. “I really went into the last lap and said I was going to give it all I had, why not just go for it,” Larkin said. [s/t Capital District Fundraising]. P.K. Subban dresses up as Jaromir Jagr during the Breakaway Challenge. Jagr reacts by laughing. Subban went on to win the Breakaway Challenge. Pekka Rinne, James Neal, Patrick Kane, Joe Pavelski, and Devan Dubnyk react to Shea Weber winning his second consecutive Hardest Shot Challenge. Similar to the reaction last year when he won it. [s/t Predators Website]. P.K. Subban shows off some very impressive puck juggling and almost scores on Pekka Rinne during the Breakaway Challenge. John Scott laughs as Patrick Kane is booed by the crowd during the player introductions. Matt Duchene scores an insane one-handed between the legs goal. The best goal of the night maybe? Roberto Luongo and Cory Schneider fight over the crease before a breakaway attempt by Brent Burns. They were actually mic’d up and it was hilarious. [s/t Blackhawks Shuffle]. John Scott makes an amazing spin-o-rama move and almost scores on Cory Schneider. [s/t Reddit Hockey].